A hard-earned victory after six consecutive defeats must taste all the more sweet. And when it comes at the end of a frustrating, unfruitful season, when one has ended second-best in the summit clashes of five tournaments, without that elusive title, it must be veritably like manna from Heaven. “Tai Tzu Ying is a wonderful player, but she is not unbeatable. I had beaten her at the Rio Olympics, and I know I can beat her again,” Pusarla Venkata Sindhu had insisted in deadly earnest last month when asked about her chances against the Chinese Taipei star who, at the last count, has spent 105 weeks at the pinnacle of the Badminton World Federation (BWF) rankings. On Thursday, the gangling 23-year-old Indian finally made good her boast. After being at the receiving end of the artistry and deception of her nemesis in half-a-dozen encounters spread over the past two years since the 2016 Olympic Games, Sindhu turned the tables on her redoubtable adversary, to record her second successive win in the round-robin women’s singles Group A of the season-ending $1.5 million prize money World Tour finals in Guangzhou. Sindhu’s fighting, come-from-behind 14-21, 21-16, 21-18 triumph in a minute over the hour mark over the Taiwanese top seed firmly cemented her place at the top of her pool with two wins without a defeat, and a 4-1 countback of games won versus games lost. She cannot now end up with a negative countback, and has been firmly installed as the new favourite to top Group A, in the race for a semi-final berth. Indeed, Sindhu can afford to tank her final pool match against the winless American Beiwen Zhang on Friday, although she would be keen to maintain the winning momentum, and top the pool with an all-win record. With Japan’s defending champion, Akane Yamaguchi, cutting down Zhang to size by a storming 21-10, 21-10 scoreline, the winner of the clash on the morrow between Tai and Yamaguchi will decide the second semi-finalist from Group A. The Taiwanese top seed and the Japanese title-holder both have a victory and a defeat apiece; and only one of them can join Sindhu at the top of the pool with a second triumph. The willowy Indian appeared to be a player with a mission on Thursday. The Olympic silver medallist and last year’s runner-up at the Superseries (now World Tour) finals in Dubai put all the gloomy thoughts of her 3-10 losing head-to-head record against Tai firmly behind her, and concentrated on muzzling her rival’s uninhibited strokeplay on the garish red Hova courts of the Tianhe Gymnasium. 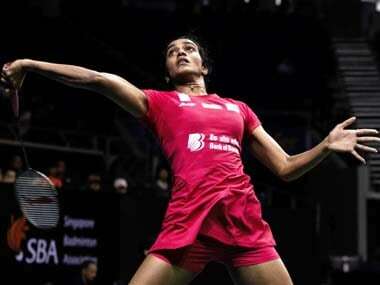 Three factors came to Sindhu’s assistance. One, the shuttles moved faster through the air as the match was being played in the late-afternoon, when the Guangzhou weather was nowhere near as chilly as it had been on the opening day of the five-day competition, when the conditions were slow and heavy. The Indian was able to employ her power strokes and aggression far more than she had been able to do against Yamaguchi the previous day. The second factor was the fact that Sindhu got to play the second game and the latter half of the decider against the drift; and so, could hit the shuttle with full power without worrying about its floating out at the rival baseline. She was thus able to make up a hefty 6-11 deficit in the decider after the change of ends, and catch up with her antagonist at 13-all. The third, and most important, factor was Tai’s reduced footspeed – something that seems to have happened since she retired injured midway through her semi-final of the Hong Kong Open last month. She had been stretched to three games in each of her earlier three rounds, and eventually confided to the media that she had carried a foot injury into the tournament, and should not have played the competition at all. It is probable that the recovery time between the Hong Kong Open in mid-November and the World Tour finals was not sufficient enough for Tai to shake off the injury. It appeared to all who have followed Tai’s triumphant march through the 2018 season, when she won a record six titles and appeared near-invincible, that she was marginally slower on her feet than usual. Perfect positioning on the court is the foundation on which her strokeplay is based; and if she is even a wee bit slower than she likes to be, she is unable to strike the shuttle with the phenomenal precision that allows her to create impossible angles, and dictate the pace and trend of the rallies. This is not to detract from Sindhu’s gritty performance, and her uncompromising will to win on the day, if only to restore her pride and confidence in herself. She did not let Tai’s domineering show in the opening game – when the Taiwanese took the lead at 3-2 and never relinquished it – divert her attention from her goal. The second stanza was a mirror-image of the first; only in reverse. Sindhu literally returned the compliment, levelling at 3-all and then grabbing the lead, to retain it till the very end of the game. The Indian’s massive leap from 6-11 to 18-13, a period when she won 12 of 14 points, virtually sealed the issue, though the ending of the game produced high drama. Leading 20-16, Sindhu judged the shuttle out along her backhand sideline, obtained the concurrence of the line judge, and raised her arms in triumph. However, Hawk-eye, acting in response to a Tai challenge, showed that the bird had landed on the outer edge of the sideline. Point to Tai: 17-20. A visibly rattled Sindhu conceded the next point tamely, and it seemed as if her mental wiring would unravel, as it has done on so many recent occasions. But this time, the lanky Hyderabadi kept her cool and played a marvelous final rally to snuff out Tai’s hopes. Sindhu’s rueful smile and the warm hand-clasp at the net from the sporting Taiwanese showed just how much the victory meant to the Indian ace. The edge-of-the-seat win over Tai has given the Indian the luxury of taking it easy on the morrow against Beiwen Zhang, although it would be in her own interest to keep the winning momentum going. The two players are locked at 3-3 in career meetings, with Sindhu winning their most recent joust at the French Open in October, after three successive defeats. Earlier in the day, Sindhu’s fellow-countryman, Sameer Verma, picked up his first victory in the season-ending finale, to make it a memorable Thursday for Indian badminton. The 24 year old Dhar native administered the knockout punch to Indonesia’s Tommy Sugiarto by a 21-16, 21-7 scoreline in Group B of the men’s singles event; and will take on Thailand’s Kantaphon Wangcharoen in his last group match on Friday afternoon. 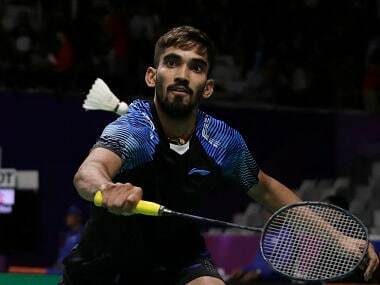 Although he had lost in straight games to the top-seeded world champion Kento Momota of Japan on Wednesday, Verma has been left with the task of bagging just one game from the winless Wangcharoen, in order to make the semi-finals as the second player in Group B. The third and final pool matches in the five events start on Friday at 11 a.m. China time (8:30 a.m., India time). However, both Sindhu and Verma are scheduled to play their concluding group ties against Zhang and Wangcharoen, respectively, on adjoining courts at the start of the afternoon session at 6 p.m. (3:30 p.m., India time).